Steve recently introduced me to Steven Universe, a children’s TV show that has also gained a cult following among adults (and what seems to be most of Tumblr). I’ve only watched a few episodes so far, but I really like it, and I love that it’s body-positive without making a big deal about it. The show revolves around the adventures of Steven, a 10-year old boy who is half-gem and half-human, and three gems who are basically his aunts: Garnet, Amethyst, and Pearl. Gems are aliens who can take human-like forms, and these three protect humanity from the evil intentions of other gems and miscellaneous monsters. Steven’s father, Greg Universe, is so far a peripheral character, and there are occasional flashbacks featuring Steven’s mother, a gem named Rose Quartz who gave up her physical form when she gave birth. Steven, both of his parents, and Amethyst are all fat–and their sizes are never played for laughs, or even mentioned. It’s treated as a matter of fact that Steven is chubby, Amethyst is short and fat, Garnet is tall and big-hipped, and Pearl is very thin. 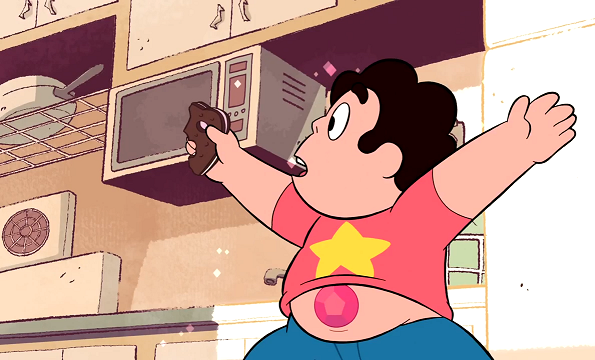 Since Steven’s powers come from a gemstone in his belly button, his chubby stomach is often visible, and this is never portrayed as negative or even noteworthy either.